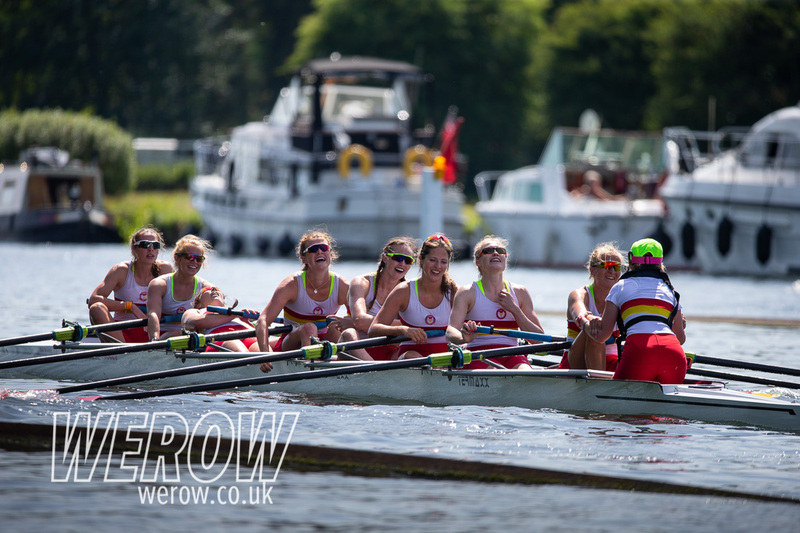 Beneath beautiful British weather, the business end of Henley Women’s Regatta got started, as crews spent the morning vying for the precious two spots in the final up for grabs in each event. The day began with the remaining quarter-finals of the regatta for the junior girls, meaning any junior lucky enough to make the finals would have to face three runs down the course before lifting a trophy. In the junior quads, a strong Tideway Scullers crew was pushed out of the competition by Headington school in a tight margin of 3 feet. Following the semi-finals, it was Henley and Latymer that progressed to the final, where Henley RC won by ¾ length. In the J4+, Henley RC came into their semi-final having had an easy row of their quarter final, following the disqualification of Marlow. They saw off local rivals Headington in the semi, leaving them to go up against National School Regatta winners Putney High School in the final, where it was the latter who prevailed and came away with a tightly fought win of ¾ length. The unbeaten J164+ from Kingston continued their winning streak, securing a victory over Marlow by 3 lengths in an incredibly calm and collected race for such young athletes. The J8+ hosted an all-American affair, and a very exciting contest between National Cathedral School and Philips Academy in the semi-final. Deemed a dead heat, there was a rerow, which the school girls went into with a very mature attitude. The race was again neck and neck, as both crews matched every push made by the other. Ultimately it was National Cathedral School who managed to draw away, snatching it on the line to secure their place in the final against Green Lake. Having raced once more than their opposition, NCS faced a tough race with tired legs, defeated by 2 lengths. 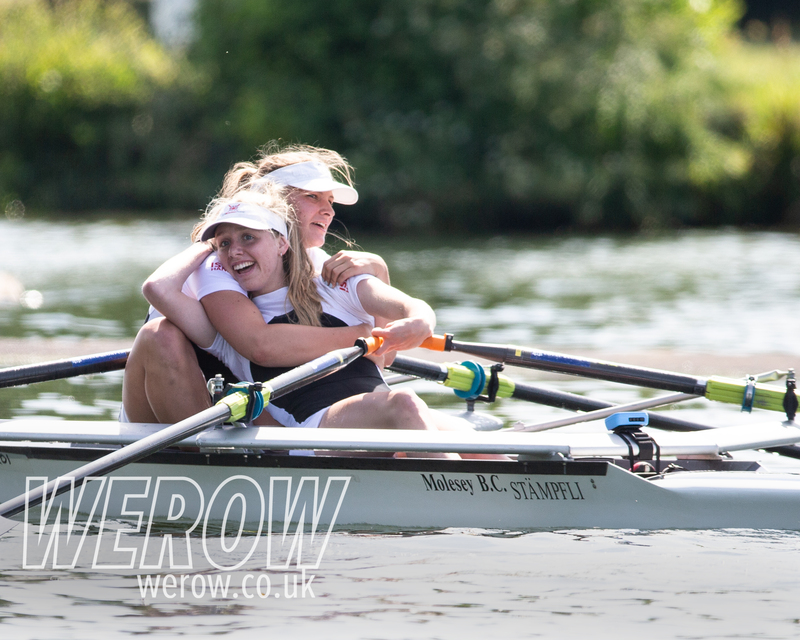 As all the athletes are matched in weight, lightweight events usually make for some very exciting racing, and Henley Women’s was no exception. In the Aspirational lightweight singles semi-final between Greenbank and Edinburgh University, the Edinburgh sculler Laura McDonald clung onto her opposition to claw her way back through in the final stages, taking the win by 2 lengths. She went on to face a Leicester University sculler in the final, where she took the win by a comfortable margin. The CH2- hosted some very tight contests. In the semi-final between Imperial and TSS the two crews were neck and neck all the way down. Imperial made a move to edge ahead at the enclosures, but Tideway Scullers fought back to seize control of the race and charged to a lead of two lengths. The TSS crew came up against a robust Leander crew in the final, losing out by 2 lengths. Last year’s winners in the Club Intermediate Eights were not so lucky to make it through to the final this year. In a very tightly fought contest, reining champs Cantabrigian were overturned on the line by Thames, who sealed their place in the final by a very exciting 1 foot on the line. Thames weren’t quite up to the pace, giving way to Tideway rivals TSS by 3 lengths. The Aspirational doubles also hosted some close racing. The Ipswich/Sudbury composite, having rowed through their Mexican opposition yesterday, repeated their race plan and came from behind to overhaul the Nottingham double by ½ length. In the final, they were down on their opposition from KSRV Njord and left themselves too much to do, conceding the win by 4 lengths. Lightweight Imogen Grant, and sole Brit left in the Championship 1x came up against a very strong sculler from Sydney University, losing out on a place in the final by 3 lengths despite a valiant performance. Two Australians came head to head in the final, with the sculler from Capital Lakes coming out on top. Siena Hayes of Cardiff University continued business as usual, storming off the start to leave Beth Wilford Dutton of Oxford Brookes left to challenge her lead, as the Cardiff University Sculler moved through to the final of Aspirational singles by 1/3 length, where she faced Sam Redgrave of Norwich and took the win by 2 and 1/2 lengths. In the Championship doubles, World U23 Champions Charlotte Hodgkins-Byrne and Lucy Glover of University of London and Edinburgh University made easy work of their semi-final against the former Olympian Katie Greves and World Junior Mattea Wuethrich of Headington School, moving to the final where they faced a Leander crew of Anna Porteus, recent University of Washington graduate and Katie Maitland. In a dominant performance, the composite crew won by a significant margin. The hugely powerful GB composite crew made light work of their semi-final against Yale’s B crew in the Championship 8s. In the final, they came up against Yale A crew, again sending them on their way and taking victory by 1 ½ lengths.